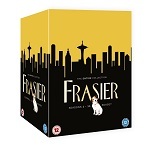 These pages list the available 'Frasier' related merchandise that is, or has been, available predominantly in the UK but where appropriate around the world. Use the links down the right hand side to jump to the type of merchandise you are interested in. Released on September 7th 2009. Released on 3rd November 2008.